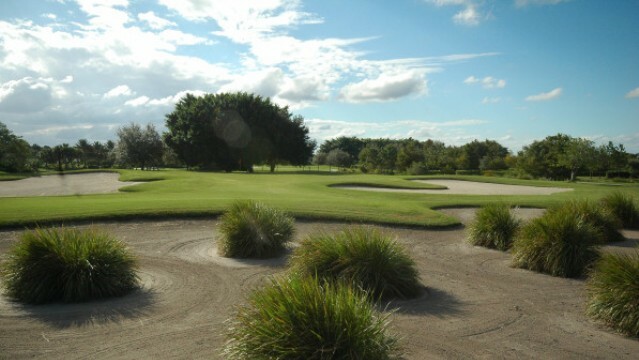 South Florida golf courses are notable for several things: flat land, water, sand traps and palm trees. The first stop on my Florida tour in January took me to TPC Eagle Trace in Coral Springs, which you may recall is unique in having no palm trees – and that’s by design. My next stop was a few minutes up the road at Heron Bay. 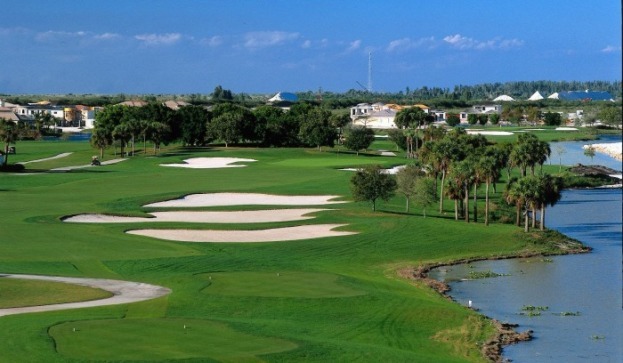 Like Eagle Trace, Heron Bay too was once the home of the Honda Classic. The course sits close to the edge of the Everglades and always features a steady breeze, if not a strong wind that sometimes howls across the open expanses of the massive swampland. While water comes into play at Eagle Trace on 16 of 18 holes, at Heron Bay you’re only faced with the wet stuff on three holes, even though it’s all around you. 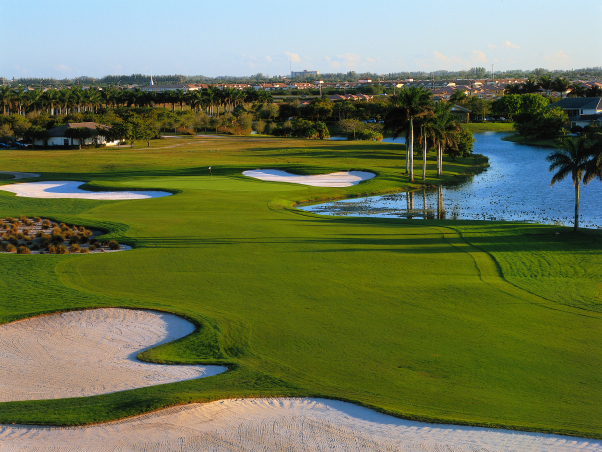 The course is carved out of land reclaimed from the Everglades and surrounded by beautiful homes fronted by ponds and canals, which sit back far enough to not be a hazard on most golf shots. What it lacks in elevation and water however, Heron Bay compensates for with sand. The origins of the course date back to the mid-nineties when the PGA Tour was looking for a new home for the Honda Classic. Wanting to keep the tournament in the Fort Lauderdale region, the ever expanding city of Coral Springs offered lots of opportunity for developers pushing the western boundaries of civilization farther and farther towards the Everglades. The combination of upscale vacation and retirement homes for winter weary northerners with their favourite recreational amenity was a winning formula and the more notable the golf course, the more developers could charge for the real estate. Mark McCumber was winding down a successful career on the PGA Tour in the mid-nineties and balancing tournament golf with course design. He already had a healthy portfolio of new courses to his credit, mostly in Florida, so when the chance came to fashion a course at Heron Bay, he was ready. And the course owners at the time were more than happy to associate their new project with a 10-time PGA Tour winner. As a player, McCumber was more of a technician than a bomber, with a canny ability to pick his way around tight courses avoiding trouble. He had a great short game and was a something of a bunker magician. He was also a Florida specialist, with six of his ten PGA Tour victories coming in the Sunshine State, where wind and water are ubiquitous, and the ability to keep the ball in play will garner you a bigger payday. Heron Bay isn’t long by today’s Tour standards at 7,380 yards but in 1997, when the first Honda Classic was played there, it was long enough. McCumber added more bite with over 100 bunkers and not just your garden variety sand traps either. These bunkers are long meandering affairs that flank some fairways and cross others, always forcing players to pick a line where the landing area isn’t always visible from the tee. Many of the cross bunkers are backed by mounds too, making long approach shots difficult. It’s definitely a shotmaker’s course. The list of PGA Tour pros that won here includes Stuart Appleby, Vijay Singh, Dudley Hart, Jesper Parnevik and Matt Kuchar, and with the exception of Singh, none of them are big hitters. 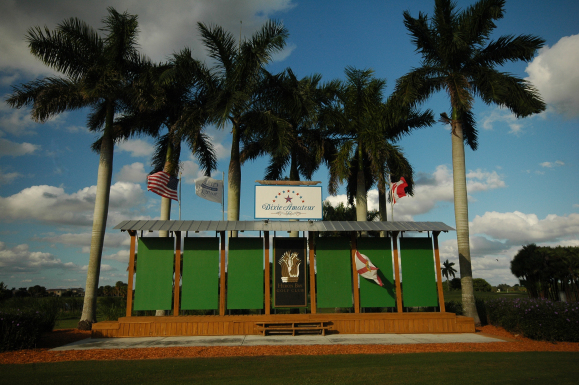 Heron Bay is also annual host of the prestigious Dixie Amateur, one of the top ranked amateur tournaments in the world. Past champions include Hal Sutton, Brandt Snedeker and Lanny Wadkins, all known as exceptional shotmakers. Parnevik also won a Dixie Amateur. The Dixie Amateur is an annual event featuring the world’s best amateurs. The landing areas at Heron Bay are actually quite generous enough once you see their full extent but McCumber has added an extra level of visual intimidation with mounding, especially from the back and middle tee decks, so you can’t always see what’s behind the bunkers. For higher handicappers, there are no forced carries over water or wetlands and there is always a direct route to the green, even if you have to skirt a few of the traps. The large greens are surrounded by mounds and deep bunkers but the real challenge is attacking the pin position aggressively. It’s OK to hit a green in regulation but if you’re left with a 70-80 foot putt, bogey becomes a distinct possibility. The greens have enough slope in them to be interesting but they don’t have any of the wild contours that characterize some Florida courses. (Note: when I played, the greens were probably a bit slower than normal due to some wet weather earlier in the week but they held approach shots and rolled well). I played the course from the WHITE tees with a couple of gentlemen from Sept-Iles, Quebec, who’s English was much better than my French. They were both retirees in their early 60’s who played local courses three or four times a week and Heron Bay was a regular weekly stop. I started out picking spots in the fairways with hybrids and fairway metals while they happily banged away with drivers. It didn’t take long to realize that there was a lot more room than I thought and no need to put myself at such a disadvantage. The WHITES set the course at 6,123 yards but on a day when we had a 2-3 club wind, that was enough for us. On the 6th hole, our WHITE tee blocks (164 yards) were actually back on the BLUE deck (197 yards) and with a 3-club wind in our face, driver was the club of choice. Worked for my playing partners. Not so well for me. The 9th is a 387 yard dogleg right that also plays into the prevailing wind and hugs the edge of a canal all the way from tee to green. The tee shot needs to cut the corner to set up a decent approach. It used to be the finishing hole before the Club switched the nines and it’s a tough par. I played #14 twice – once from the tips as it carries 187 yards across the edge of the water to a big flat green; and once from the WHITE tees at 116 yards. Made par both times but from the short tee deck, it felt like a bogey. The last hole is a beauty. It’s 566 yards from the back but only 476 from our tee deck and it bends a little from left to right. There’s a massive cross bunker on the right that’s in the landing area but if you can carry it, it chops off a lot of real estate and you’re left with a mid iron or hybrid approach. I hit two great shots to give myself a very rare eagle putt! Made my par too. Yaaaach! I look forward to doing better next time. 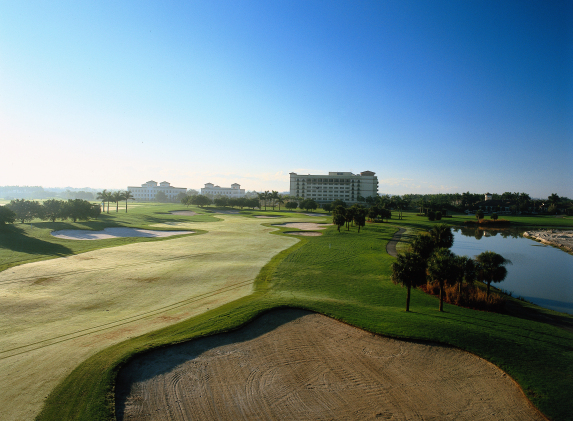 For more information on Heron Bay, please click HERE.